While snowed in this weekend, I got the chance to play with the new SAB set from SU!, free with a purchase of $50, called "Fresh Vintage". I used it three different ways, each a different style & each using a different technique. 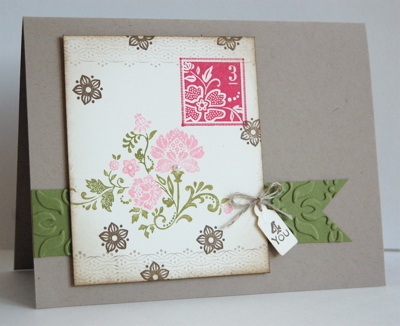 For this card first card, I went for more of a vintage feel. I used the Collage Technique, which is simply layering on the different elements. The focal image was colored with markers, then stamped onto the cardstock. 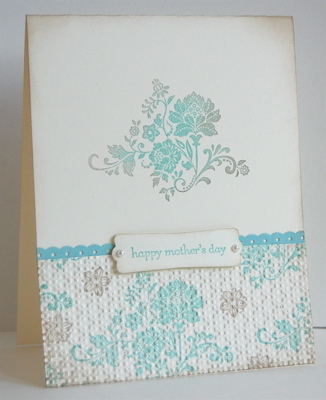 In addition to sponging, I added a single pearl & embossing for a bit more depth and interest. Tomorrow I'll share another card using Fresh Vintage. You'll be amazed how some different colors can give this set a whole new look. See you then! 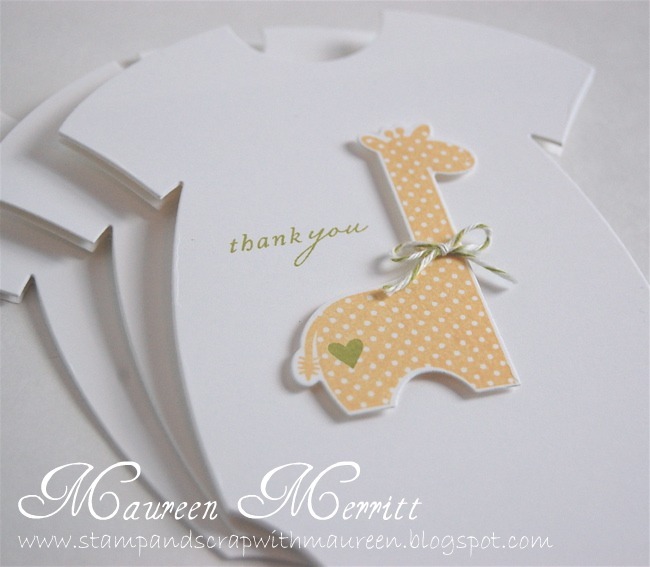 Just popping in on this snowy Saturday with a quick card set I made yesterday inspired by yet another creation by Jennifer McGuire. She is one talented lady! 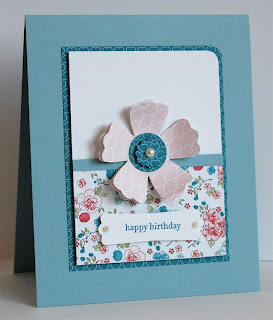 The Clean and Simple Card Making Class has been so inspirational, my head is spinning with ideas!!! I made these three cards in under 10 minutes. 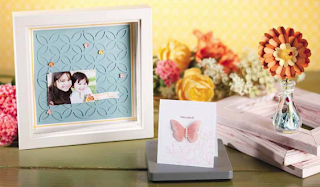 I used PTI's Flower Fusion & Fillable Frames, placing a different sentiment on each card. This is a great little set to keep on hand or to give as a gift. With these bright colors even young girls would like them! I'm hoping to make a few more sets, a bit more involved, so stay tuned! 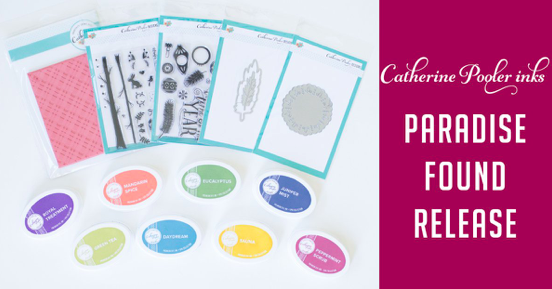 As I mentioned the other day, we have been talking a ton about CASE-ing and how to make a project your own at StampNation. 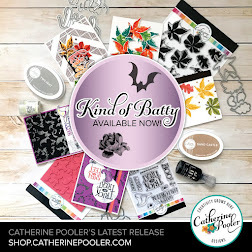 One of the videos Catherine shared with this week was how she modified one of her own cards and came up with something completely different. It's amazing how the same basic design can change so much with a few different colors & details. I decided to take her sketch and make a card all my own. I had originally thought of changing the orientation, but decided I liked it better this way. I started with a Pink Pirouette cardbase and a 4 1/4 x 5 1/2 inch layer of Very Vanilla cardstock with I embossed with the Elegant Lines Embossing Folder. Then, I punched out 3-1 1/4 circles & 3- 1 3/8 inch circles of Beau Chateau dsp. I die cut the butterflies with the Beautiful Wings Embosslit and adhered them with a glue dot, then embellished them with a Basic Rhinestone. 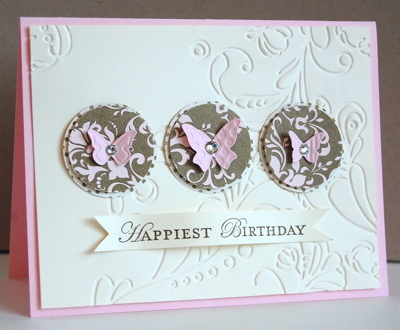 The layout of this card is also quite similar to one of the sketches from Day 1 of the Clean & Simple Card Making Class, only with larger embellishments. Do you want to take the challenge? Head over here to join or learn more about StampNation. I'm on a color blocking kick! The Splitcoast CAS sketch (CAS153) this week led me right there. 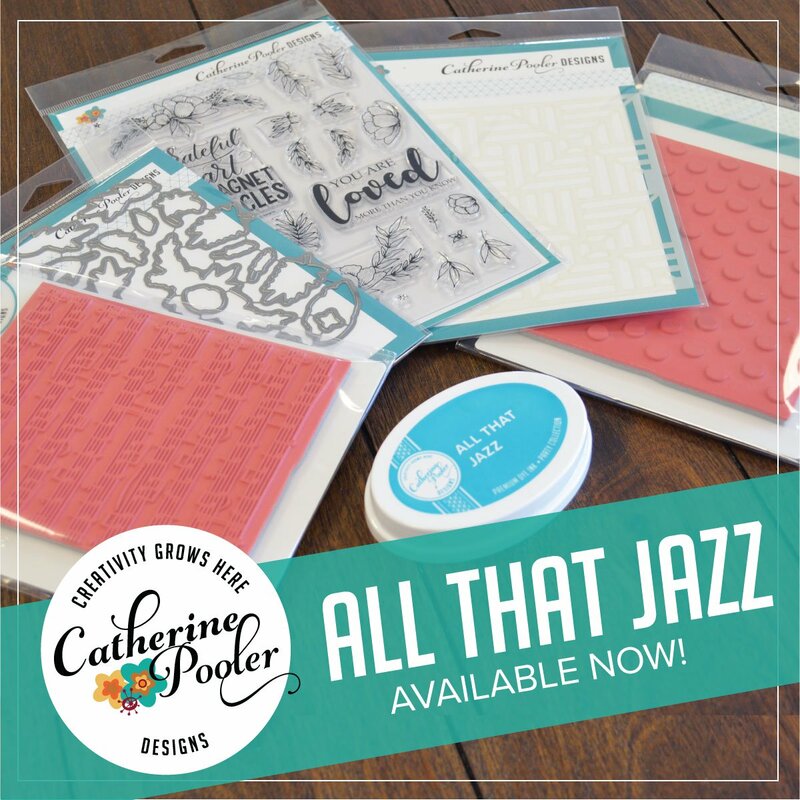 I started by stamping my background using an acrylic block in Crumb Cake, Pool Party & Lucky Limeade inks. Then, I stamped a flower from Awash with Flowers & my sentiment in Basic Black. I rounded the top corners & adhered the focal panel on dimensionals. It really doesn't get much easier than that. 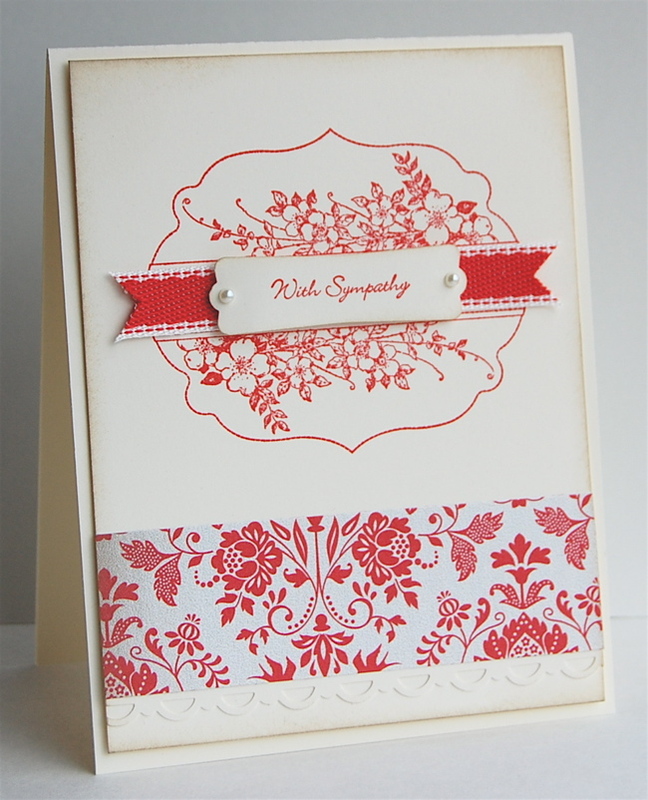 Day 7 of the Clean & Simple Card Making class focused on "Plainly White" cards. Julie joked that when people hear that, they run :) I happen to LOVE plain white and have found myself using it more and more. 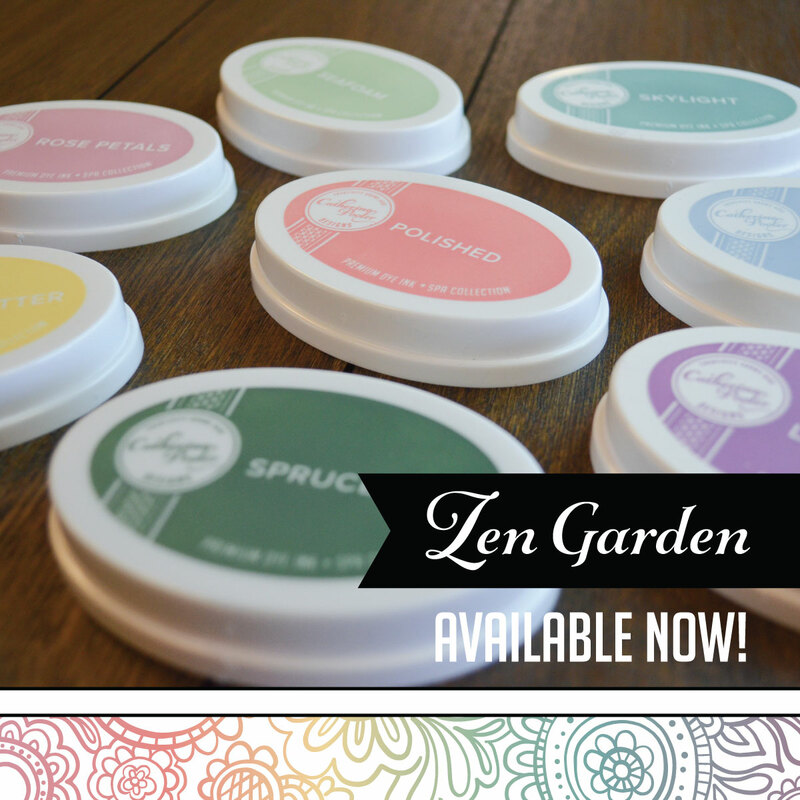 Actually I need to stop using it a bit so I can order more before I run out!!! 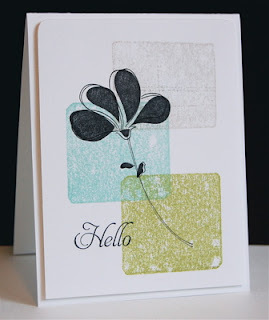 This card is an ode to plainly white cards, a CAS stampers staple! Wow, did I really last post on Sunday? My goodness, I have so many projects to share I don't know where I am going to start. 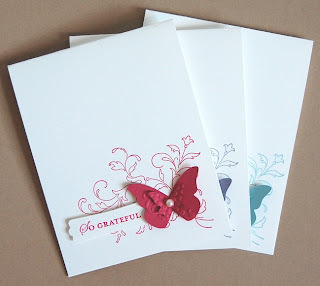 I think starting with my "So Grateful" card is a good place! 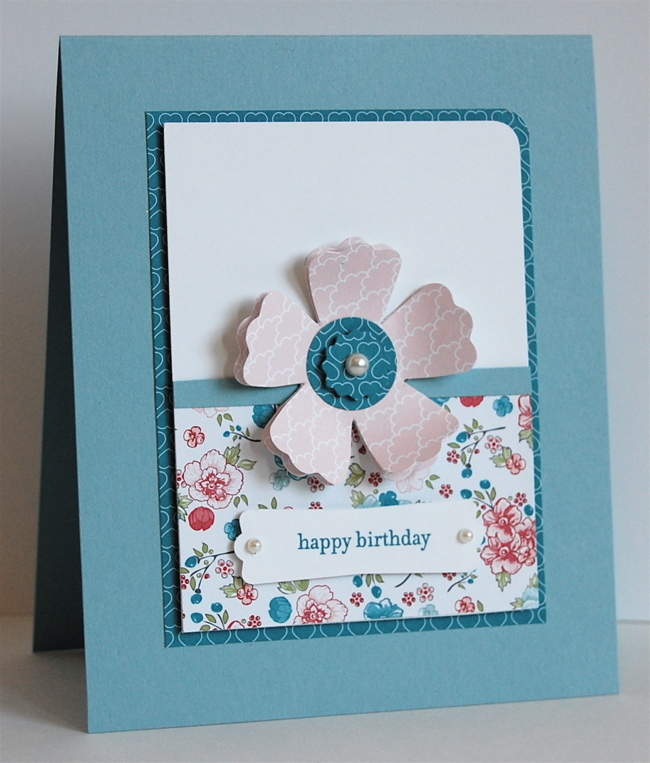 This CAS card was inspired by a video tutorial by Jennifer McGuire from Day 7 of the Clean & Simple Card Making Class. I started with 3 different dsp and cut them into 1/2 inch strips, then adhered them on a diagonal to a piece of 5 x 5 scrap paper. Once all of the papers were in place, I cut the 5 x 5 square into 1 inch strips, like you see on my card. 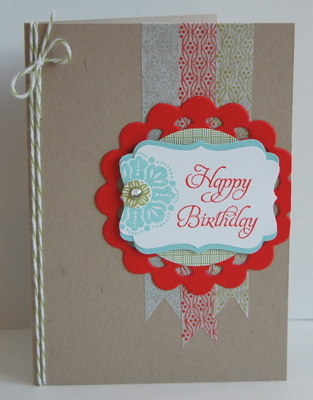 I have quite a few that I can use later on other projects or to make this particular card into a set. 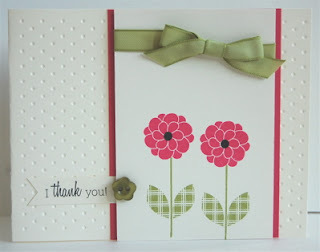 This card is also part of a challenge we have going at StampNation...Using Trends in your papercrafting projects. 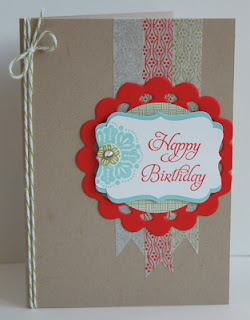 Color Blocking is really big in clothing & home decor, so why not translate it into card making. Makes sense, right?! 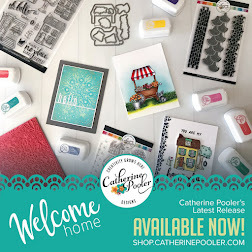 To learn more about StampNation, or to join in some of our topics (Scrapbooking & TV are all over the forum right now), view the gallery (over 5,500) OR watch one of 150+ videos, click HERE! The Outlawz challenge for this week is to use Bakers Twine. 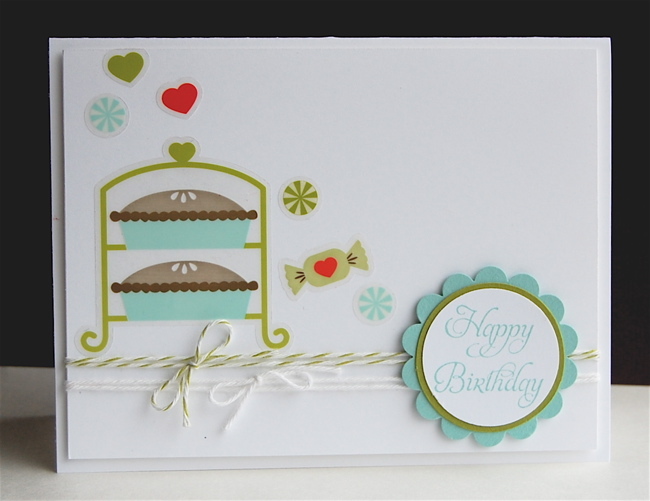 I thought it would be cute to pair it with the new Sweet Shop Designer Stickers & a birthday sentiment. 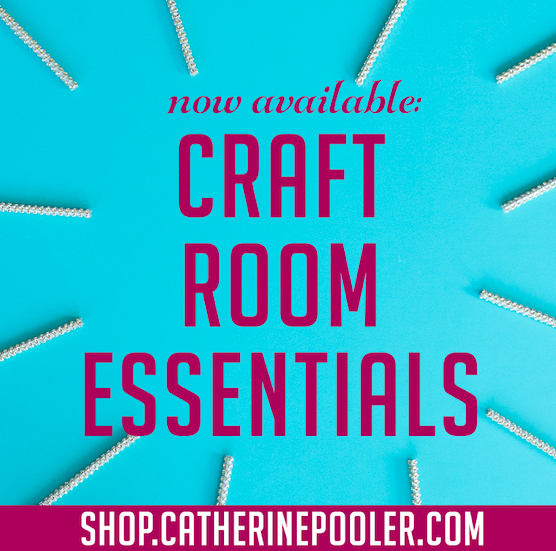 I love all of the colors of bakers twine available now. It's too cute. 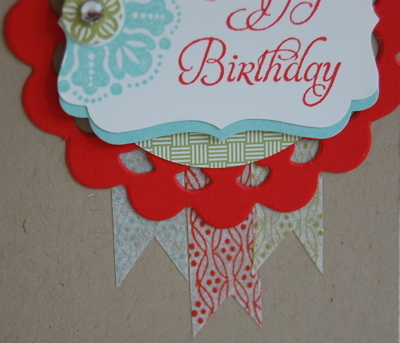 I use it way more than ribbon, it's just the perfect addition to any card. 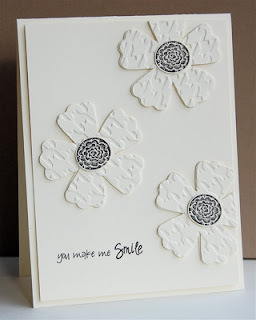 Some of the DT samples are really creative this week, so be sure to pop in and take a peek. We've been talking about CASE-ing cards lately at StampNation. I've had my eye on the card pictured in the center above from the Stampin' Up Catalog and decided to CASE it. If you don't know what CASE means, Copy And Share Everything. 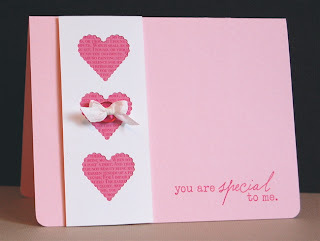 Usually when you CASE a card, you change the colors or design a bit to make it your own. 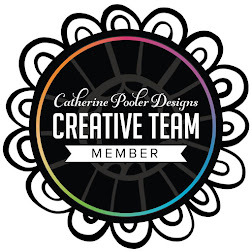 When you "copy" or don't change anything, it's nice to give the original designer credit. 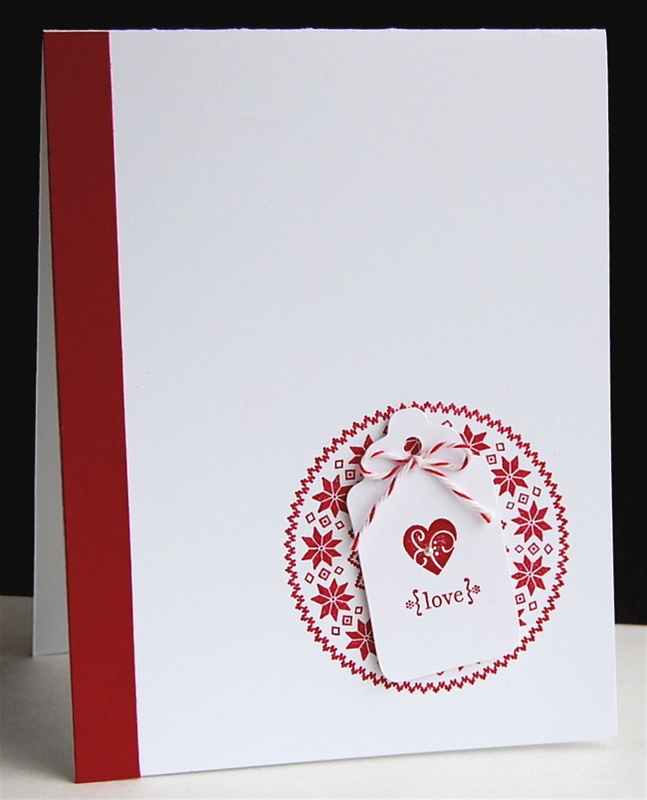 On my card, I used the same idea, however, my card keeps the design in the bottom portion while leaving white space at the top. 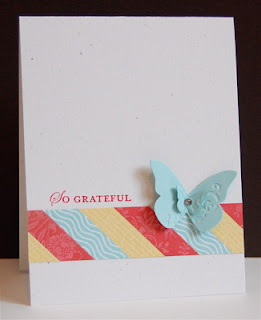 I layered two butterflies that were die cut using the Beautiful Winds Embosslit. 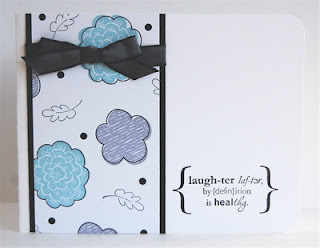 I also punched out my sentiment using the Modern Label Punch. 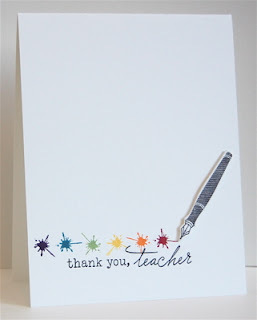 This is an awesome card for mass producing. I made three different colors while my supplies were out. It will make a nice gift set, don't you think? Want to know more about how to CASE a card? 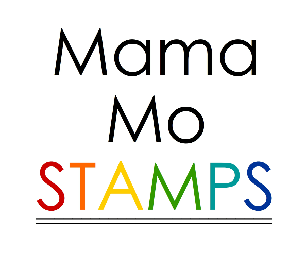 Stop in at StampNation where we have a whole discussion on it. StampNation just celebrated its 1st birthday :) There are over 145 videos now, a gallery with over 5,500 cards & projects, challenges and much MORE! December through January is jam packed with birthdays for us...my SIL, BIL, sister, Mom & a close friend. Oh yes, and then put Christmas right in the middle! So today I have yet another feminine birthday card. 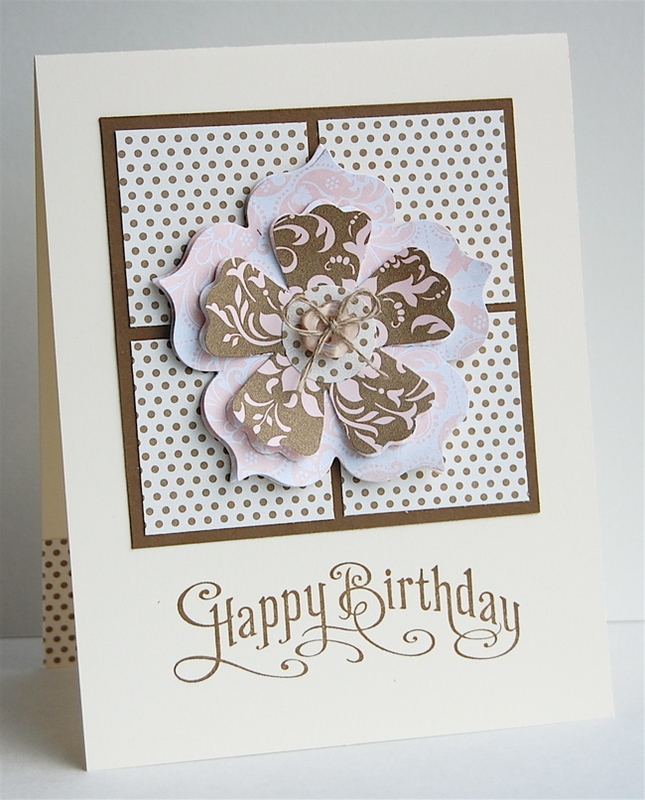 I used the Beau Chateau dsp and the Fun Flowers die to make this card. 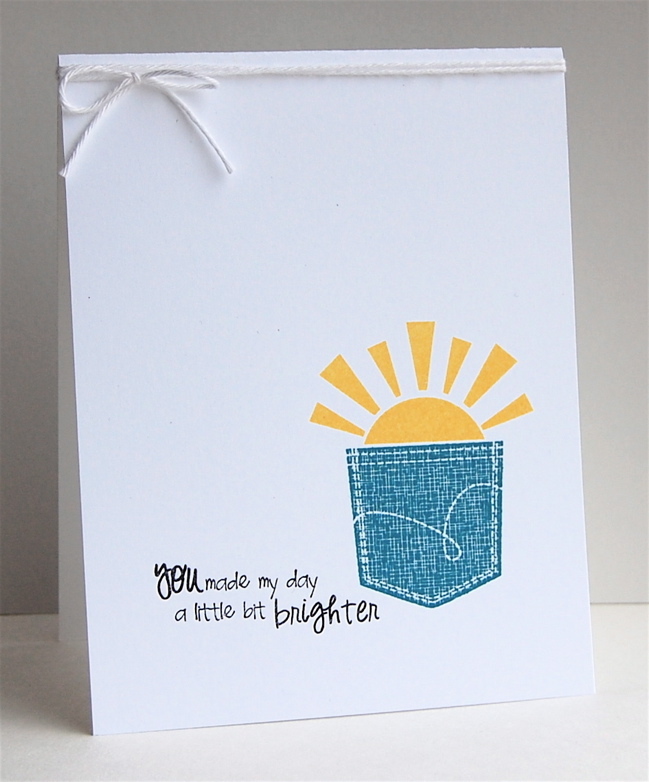 I love that patterns in the paper paired with the font in the sentiment from Perfectly Penned. Do you notice a tiny bit of dsp on the INSIDE of my card? One of my goals this year is to complete each card inside & out. After what I went through this Christmas with my cards, I am not going to let that happen again. It's so much easier to complete the inside while everything is out. Expect to see more of that! *I was inspired by CPS250 sketch & CAS152. It's time for The Outlawz Clean and Simple Challenge. Our challenge to you is to use tags. You can make a tag to add to a gift or project OR use a tag on a card! The DT girls got SO creative this week, you really need to head over to the CAS Group and see what they did with their tags, wowzers! My card takes CAS to the extreme. 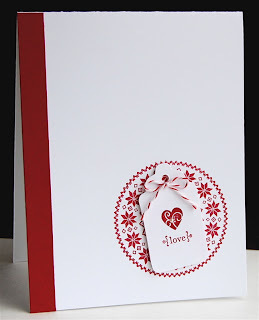 I'm really loving just a white card base lately, the crisp clean look really appeals to me. So, this is where I started. 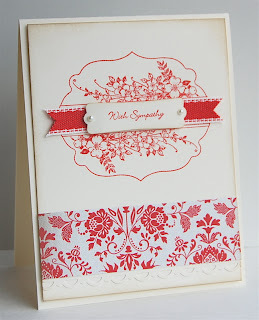 I used Cherry Cobbler ink and an image from Winter Wishes that I stamped in the lower right corner. I die cut my tag and stamped it using the Tiny Tags stamp set, then embellished it with a single pearl and a bow made of bakers twine. At that point, I thought about calling this card finished, but it was a bit too blah. I thought to myself, "What would Maile do?" (In my eyes, Maile Belles is the Queen of CAS. I want to be her one day :) And, "ding", the light bulb went off...a simple strip of Cherry Cobbler Cardstock on the left. Perfectly balanced!! Head over to The Outlawz and play along with the CAS Group, I'd love to see you there! Hello there, happy weekend to you! 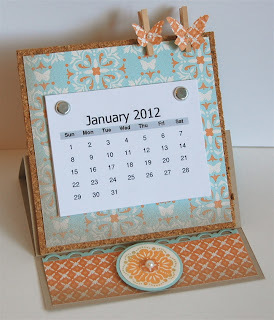 I started out my Saturday morning making this 2012 easel desk calendar. 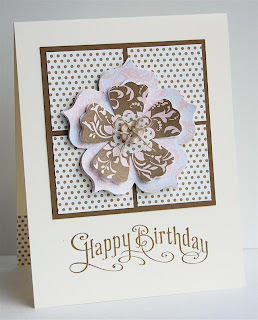 One of my stamping goals for this year is to step outside my comfort zone a bit and attempt more 3-d projects. There are so many resource available online, I don't know what has held me back! I followed the instructions for an Easel Card & replaced the card front with a calendar which I printed from the Resource section at SCS! Easy Peasy. (Rock & Roll). The butterfly clothes pins are removeable, so you can attach notes etc as well. I'll be back tomorrow with an Outlawz CAS challenge. See you then! A quick note to let you know that my Etsy shop, Inspired Card Designs has been updated!!! And, you can be looking for more updates later in the week! Sympathy cards are some of the hardest to make, especially when you NEED one. So I thought it would be a good idea to make one now, while, thankfully, I don't need it. I'm thinking of making a few more like this one in a variety of colors to have on hand, just in case. 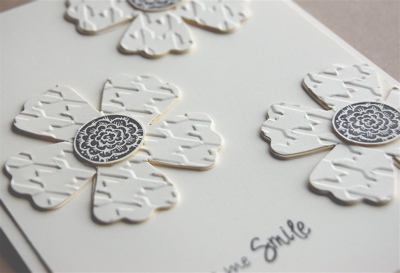 While creating sympathy cards, I try to keep a few things in mind... simple, soft, floral or inspired by nature (trees, leaves, etc). This card is also for the StampNation challenge, which happens to be "Sympathy Cards". Hop on over and check it out!! 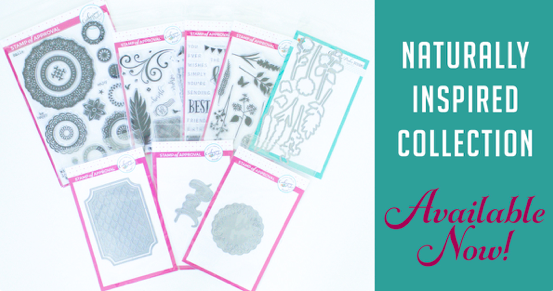 Now is the perfect time to join, the Occasions Mini Virtual Open House starts on Wednesday!! I can't think of a better way to start off the new year than with The Outlawz and a CAS Challenge. Welcome in the New Year with a fresh clean start and a fresh clean card. 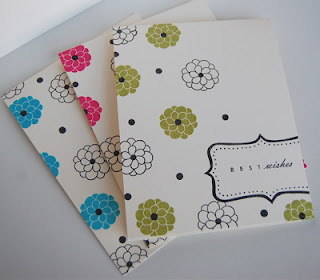 Use a white base and no patterned paper. I used Wplus9 A Pocketful on my card today. I thought filling my pocket with a bit of sunshine would be the perfect way to start off the new year. For me, the sun represents a positive attitude, happiness & good things to come. Head on over to The Outlawz and join us today!